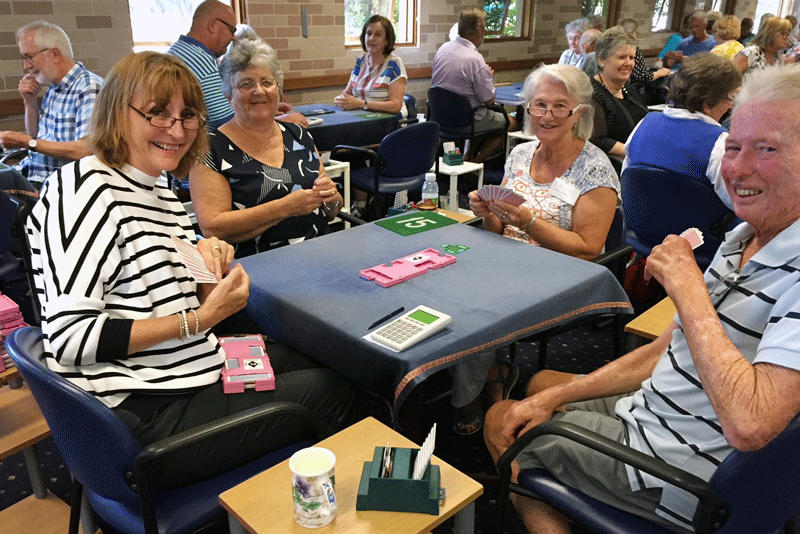 News updates, challenge hands tips and recaps from Australian Bridge Teacher Joan Butts. Peninsula Bridge Club is an ABF Accredited Teaching Club that prides itself on its friendly and fun environment. Based at the Nelson Heather Centre in Sydney’s northern beaches area, the club has approximately 600 members, a very busy events calendar and a successful education program. “We are seen as the friendliest, fun bridge club around. Players come early to socialise and stay after a game to review and chat,” Peninsula Bridge Club Director of Bridge Education Cath Whiddon said. The friendly culture is something the club works hard to maintain, and it has proven to be the key to attracting and keeping new members at Peninsula. “We teach the etiquette of the game from the very first lesson – for example, we emphasise welcoming opponents to the table,” Cath said. “We celebrate all of our members’ bridge successes at all levels – starting with their very first ABF ranking certificate. “We always provide a social break for tea and a chat in all our sessions and lessons. Peninsula’s bridge education plays a key role in attracting new players to the game, and the classes and playing options are designed to retain them. The current education program started in 2010 when Cath started a beginners course with a group of 10. “All 10 completed the course and expressed a desire to continue, so a supervised practise play session was started,” she said. Peninsula’s Bridge Education team now consists of three ABF Accredited Teachers, five Accredited Directors, and three supervisors (all of whom are close to completing the ABF Accredited Teaching Programme) who are all coordinated by Cath. “We promote Peninsula as an “ABF Accredited Teaching Club” and we follow the ABF education program and bidding system – from the fundamentals (Standard 5 Card Majors) and its Intermediate to Advanced Conventions. “We, both teachers and students, love the ABF resources and videos provided online and we are forever grateful for the ABF’s support in creating a national Teaching Coordinator (Joan Butts) and a national Marketing Coordinator (Sandra Mulcahy) who guided our growth and success – we could not have achieved anything without them. Cath said there were a few tricks for attracting and keeping members but listening to their feedback is important. “Before each course I reread the ABF STEAM Philosophy of teaching – it’s simple and effective. “In particular, the Safety Guarantee and a welcoming smile are a winning combination… add in choccie biscuits and you’ve got them! For Peninsula Bridge Club, a big challenge for the club is keeping up with the club’s growth in member and player numbers, which Vice President David Farmer acknowledged is a pleasant problem to have. “The influx of new keen players has energised the entire club. It has helped us continue to grow as a friendly club and be able to support all types of players: learners, social and competitive,” he said. Six-week day and night beginner courses, run twice a year by the Club’s ABF accredited teachers. Three supervised sessions each week (a morning, an afternoon and night option), where newer players can gain confidence in a relaxed learning environment. A monthly Bridge Education lesson, focused on one topic, is incorporated into each supervised session timeslot. This helps improvers develop new concepts. A mini review of the monthly Bridge Education topic, using a set hand for each table to practise & discuss, is completed before the start of each supervised session. Results from all supervised sessions are emailed to players using Pianola to review. Supervised Session attendees are shown how to use Bridgemates for scoring and Pianola & Pianola Plus to review and replay hands. An Improve Your Play course and Killer Defence course are offered each year, with both courses consisting of one weekly lesson over four to eight weeks. Sign up to receive Challenge Hands and special offers. Online Bridge Game powered by Sky Bridge Club.